AT&T and T-Mobile have never had a friendly relationship really. But, after AT&T tried (and failed) to buy T-Mobile, the companies have had a history of swapping spectrum to create more contiguous spectrum blocks and to fill in gaps in T-Mobile's coverage. Well, the two companies are at it again with a new agreement to swap more spectrum. FCC filings show that AT&T and T-Mobile have agreed to swap PCS and AWS-1 spectrum licenses in various markets, including Boston, MA; Hartford, CT; Phoenix, AZ; Minneapolis-St. Paul, MN; Tulsa, OK; Sacramento, CA; and Austin and San Antonio, TX. The carriers say the swap will "enable more efficient operations by creating larger blocks of contiguous spectrum and aligning spectrum blocks across markets." The move is pretty clear for both sides, because contiguous blocks of spectrum allow the carriers to strengthen Wideband LTE offerings in various markets, which should provide more capacity and speed for customers. The two sides have agreed to trade equal amounts of spectrum, but the entire deal needs to be approved by the FCC before it becomes official. OMG!!! Just kiss and make up!! AT&T and t mobile I have t mobile and no issues on LTE anyplace I go I used to have AT&T and had worse LTE so I think it should be AT&T asking t mobile for help ??? I don't know?? There should be just one huge cellular company and all satisfaction for all but as we know this will never happen just as Apple v/s android I use both so I have no argue on that but Apple does lag this year!! Verizon is the only way to go as a Driver. Yeah, I heard the same from my Bro-in-law who's a Driver... Verizon is best for Logistics..
Keep in mind that no carrier have perfect signal. T-Mobile has its weak spots just like AT&T, Verizon, Sprint and other carriers. I get that you shouldn't HAVE to but this is commonly solved with using wifi connection at home. Plenty of places have construction that makes it hard for any carriers, some places are just dead spots. Then again I use a bt headset around home just with the phone on my desk so your situation doesn't seem all that unappealing to me. Or you know, call them, get a FREEEEEEEE signal booster of either the LTE or Cellspot wifi, variety. I've seen more dead spots from Verizon then the other carriers. My co workers always getting poor signal. T-Mobile is not bad, they're switching with AT&T to improve the networks of both carriers it's not that one is worse than the other. 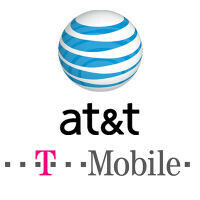 Besides both carriers to great in major cities especially T-Mobile.